An initial wave of fear swept over me the first time I heard that the piece of land between the Ables Building and the Poole Building on South Avenue was going to be developed. You see, in Rochester’s South Wedge, almost every building is saturated with an adorable, turn-of-the-century charm. That is, except for those buildings built in the latter half of the 20th century. Would this most quintessential parcel in the heart of the South Wedge’s business district fall victim to the same uninspired “modern” architecture that seemed almost inevitable? I was worried. But as the announcement continued, I heard one reassuring attribute after another. “Mixed use (residential & commercial), a mansored roof, increased parking, and a design that would add depth to the historic South Avenue streetscape, rather than interrupt it.” I crossed my fingers that Konar Properties, the developer, could pull it off. Now, two years after that original announcement, South and Hickory Place has opened its doors to reveal a beautiful finished product that delivers on all of its builder’s promises. Nested amongst the South Wedge’s most popular businesses, South and Hickory place offers new commercial spaces that have the neighborhood abuzz over what businesses might materialize there. The 40,000 sq ft. building also provides thirty-three much needed new living spaces to the increasingly popular South Wedge Neighborhood. A well-lit parking lot keeps residents’ four-wheeled friends off the streets, which is especially convenient in a neighborhood whose existing on-street parking is already in high demand. Once past the pin-code secured entry, residents step into the cheerful yellow lobby, where they take a short jaunt down some steps and past the mail boxes before arriving at their choice of stairs, or a shiny new elevator. Sleek charcoal colored hallways lead way to studio, one bedroom, and two bedroom apartments on the second, third, and fourth floors. Some of the units have Northern facing windows which offer beautiful skyline views of Rochester’s very nearby center city. Other apartments offer picturesque views of the bustling South Wedge neighborhood below and the spires of Colgate Divinity in the distance. In several of the units, french doors open onto small balconies to overlook South Avenue. Gleaming hardwood floors lead the way past wide open, well equipped kitchens and into notably spacious bathrooms. South and Hickory Place offers its residents laundry facilities on every floor, as well as an indoor garbage disposal area which is kept remarkably clean. Two thirds of the apartments rent at market rate, ranging from approximately $645 for a studio to $1075 for a deluxe 2 bedroom with 2 full baths. The other third is what is known as “affordable housing,” meaning that there is a minimum and maximum income threshold, and management accepts certain forms government assistance. The story of how South and Hickory Place came to exist is, in and of itself, a point of interest. Normally, a developer scouts out a site, designs their space to code, and builds. If a neighborhood is very lucky, sometimes a builder will incorporate a suggestion or two from the community. In the case of South and Hickory Place, however, it was the South Wedge Planning Committee who approached Konar Properties about the hole in the South Ave street-scape, making it no wonder that the building seems to taylor fit the neighborhood. Design charettes hosted by Konar allowed neighborhood input on everything from the lighting fixtures to the building materials of the exterior walls. South and Hickory Place now shines as a beacon for other communities, reminding them to get involved in new building projects, to use the space intelligently and efficiently, and to demand of their builders the highest level of architectural authenticity. Many of the apartments were snatched up quickly following the Grand Opening on June 1, however some units at South and Hickory Place are still available. Click Here to see the full listing details for South and Hickory Place, or enter the listing number,P1105, into the listing number field on the Newdigs Homepage, or into the Newdigs iPhone listing look-up. 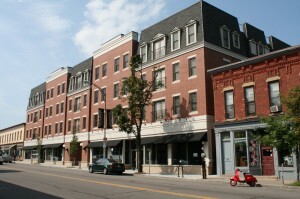 The South Wedge is one of Rochester’s hippest neighborhoods. Packed to the brim with compost-enthusiasts, tattooed hipsters, sweet little old ladies who’ve lived there their whole lives, and culture galore, the South Wedge is a highly symbiotic blend of environmentalists, artists, and community-involved residents. What’s your neighborhood like? We’re dying to know! We’re determined to turn this blog from its current humble beginnings into Rochester’s one-stop shop for all rental market information. Heck, we wouldn’t mind becoming a one-stop shop for rental information in every city. With our aspirations set so high, here at the Newdigs blog headquarters, we’re finding ourselves with an awful lot on our plates. That’s why we’re reaching out to you, the Rochester community, to help define our amazing towns and neighborhoods. Tell us what there is to love about the South Wedge, the Maplewood Neighborhood, Swillburg, Corn Hill, Fairport, Webster, and the list goes on and on and on. When we’ve got at least 2-3 descriptions of any given neighborhood, we’ll put the descriptions up to a vote, and let you readers decide which description of your neighborhood most aptly describes the place you love. We’re so excited to see what you come up with, Rochestarians! You’re helping us create an amazing resource for folks who are looking to move to Rochester, but don’t know which town would best suit them, and we’re sure that they’ll be almost as grateful to you as we are!